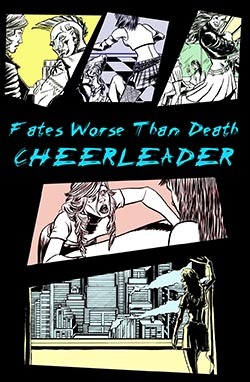 A comic set in the Fates Worse Than Death universe. Download the Comic Book Reader or PDF formatted versions. Or read the entire comic online here. 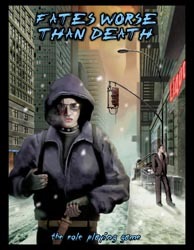 This is a free ‘lite version’ of Fates Worse Than Death, available for download in Adobe Acrobat (pdf) format. It’s 241 pages and is a complete game, with skills, equipment, a ton of setting information and everything else you’ll need to create characters or GM the game. 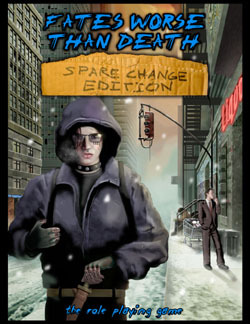 However, FWTD: Spare Change edition only comes with the character creation options and setting info pertinent to Street People characters (one of three socioecenomic classes in the city). The full commercial version of Fates Worse Than Death has charcter creation options and setting information for all three classes.